There was once a young man from a very small Italian town called Bulciago who wished to change the world. As soon as he finished his exams, he began his quest. He traveled near and far, and when he arrived in Jerusalem in 2002, he knew he had found his calling. Vittorio’s history sees ‘ordinary people’ as actors who can change the world: courageous sailors who can challenge great military powers, doctors dashing through borders and saving lives, writers, teachers, speakers, musicians and people from all backgrounds. Vittorio’s middle name was Utopia, but his was hardly a utopian undertaking. It was very much real, and Vittorio was himself charting the way for others. Once in Gaza, he was determined to see his mission through to the very end, despite having many compelling reasons to leave. In September 2008, he was injured by the Israeli navy as he accompanied Palestinian fishermen in Gaza’s territorial waters. A month later he was arrested ~ or more likely, kidnapped ~ by the Israeli military, and subsequently deported. A month later he returned, just in time to report on the so-called Operation Cast Lead. This was a one-sided war on Gaza between December 2008 and January 2009, following the failure of the siege to achieve Israel’s political objectives. The 22-day war killed over 1,400 people and wounded thousands more. Vittorio was there to witness it all. As many turned the war off and on through their remote controls, Vittorio was accompanying ambulances in middle of the night, comforting the wounded, weeping with the bereaved, calling on the world to help, and surviving the war himself. He sent daily dispatches to Italian media, blogged on his website and wrote to friends the world over. His book, Restiamo Umani (Stay Human) offers a glimpse into the courageous man’s experiences. In his first entry, he wrote as an Italian activist. By the end, he was a Palestinian man besieged in Gaza. In the eyes of some, he was dangerous. A US-based far-right website called for his murder. It was not Vittorio the person that alarmed Israel, but the notion of what he and others like him symbolized – a challenge to the predictability of a conflict between a powerful oppressor and a powerless but defiant oppressed. As far as Israel was concerned, an idealist from a northern Italian town had no business being in Gaza, where people are indefinitely caged in an open air prison. Neither Vittorio nor any other international activist was supposed to disturb the inhumane experiment. Yet, Vittorio’s story had a most unexpected twist. On April, 2011, he was kidnapped and murdered. His murderers were Palestinians from Gaza, commanded by a mysterious Jordanian character whose origins and motives remain unclear. It was a horrifying, anti-climactic end to a story that was never intended to turn so wrong. It took Palestinian society a long time to reconcile with the fact that Vittorio’s murderers were in fact Gazans, while others gloated with triumph. Vittorio’s very detractors were leading a media war defaming Palestinians, international activists and the supposedly misguided Italian who believed that the ordinary can change history. 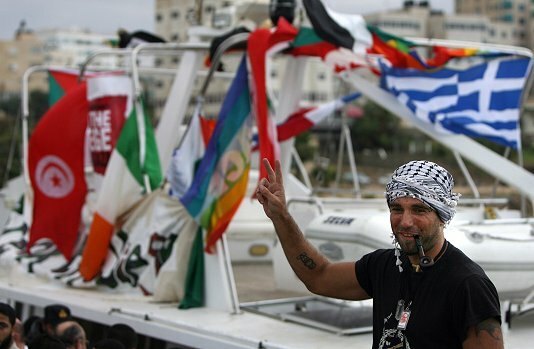 “Few events ~ not even the execution of Osama bin Laden ~ have caused me greater pleasure in recent weeks than news of the death of the Italian so-called ‘peace activist’ Vittorio Arrigoni” (as quoted in View from Jerusalem with Harriet Sherwood on May 18, 2011). While Sherwood found the comments ‘shocking’, pleasure at the killing of a peace activist is fully consistent with Israel’s ceaseless efforts at ‘discouraging’ international activists from showing solidarity to Palestinians. Hamas, which has controlled the Gaza Strip since the breakup with rival Fatah in 2007, seemed genuine in its attempt to capture Vittorio’s killers. An investigation quickly pointed at Salafi groups, Tawhid and Jihad, Army of Islam and others. A manhunt followed, leading to the killing of a Jordanian citizen, Abbad a-Rahman al-Brizat, and Palestinian refugee, Balal al-Omari. Others were captured, and in September 2011, a trial began. The trial of Vittorio’s alleged killers has not exactly been a model of transparency. On September 4, a verdict is scheduled to be handed down to four men accused of involvement in the murder. Al-Brizat, the Jordanian man, was perhaps the most important key in the trial. He is gone now, and allegations that his true aim was to exchange Vittorio for an imprisoned Salafi leader, Hisham al-Saedni remain unverified. Just eleven days before Vittorio’s murder, another activist, Juliano Mer-Khamis, was murdered in Jenin, in the West Bank. The timing of the killings is puzzling and suggests a larger plot. Hamas and other Palestinian officials suggested hidden Israeli hands in both the vile acts, but the thread is yet to be found and unraveled. Earlier this month, Hamas freed al-Maqdissi ~the man the supposed Jihadists wanted to free ~ citing lack of evidence. A few days later, following the murder of Egyptian soldiers in Sinai, it cracked down on his group. The plot here starts to thicken beyond the ability of any straightforward narrative to explain all the missing links. On September 4, four men will be awaiting the verdict of a Gaza military court. But much more will be on trial that day, not least the credibility of Gaza’s legal system. Many questions will need to be answered to truly understand what is transpiring in the Gaza Strip, and who is behind the hidden agendas. The killing of Vittorio was intended to not only kill him as a person. It was also meant to destroy the very idea that sailed with him and his friends to Gaza in 2008: that ordinary people are history and that they, and only they, will eventually make the difference in a world ruled by sheer interests and military might. Yes, justice for Vittorio Utopia Arrigoni is paramount, but we expect the Gaza government to hand down more than a verdict, but answers to those trying to kill Vittorio’s dream – along with our humanity. This is how they plan to crush resistance to the NWO at home. Update and further from earlier post.